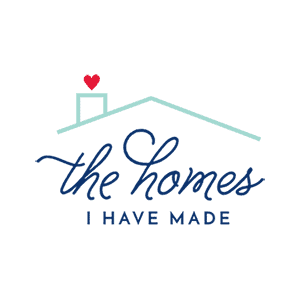 We’ve been experiencing a bit of a domino effect around the house lately…and I’m loving it! The trunk that used to sit in the playroom and serve as our play/coffee table finally bit the dust. 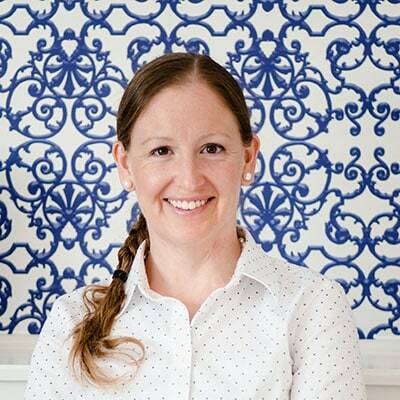 That gave me an excuse to find a table better suited for the space and our needs (more on that in a future post). However, the old trunk held most of our kid-friendly games and the new coffee table I picked out doesn’t have any storage. 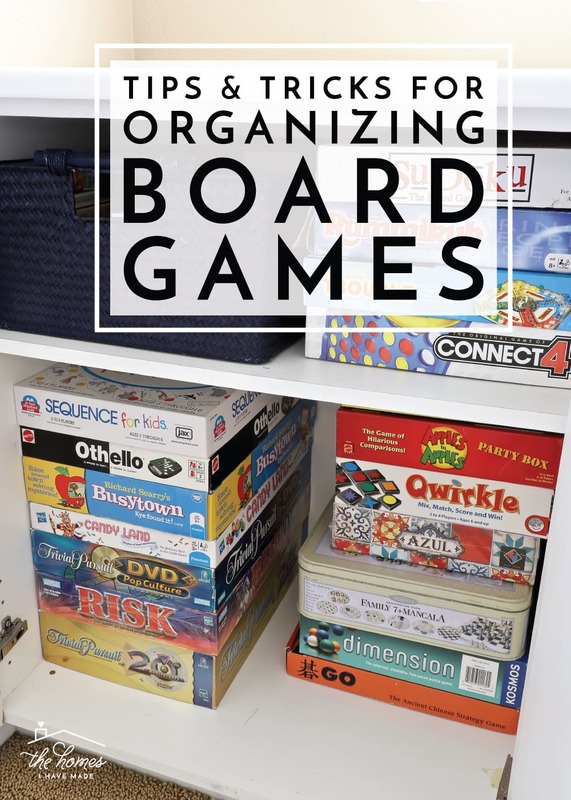 Finding a new home for the board games meant shuffling all of our upstairs storage cabinets in both the hallway and laundry room to ultimately find better homes for everything. 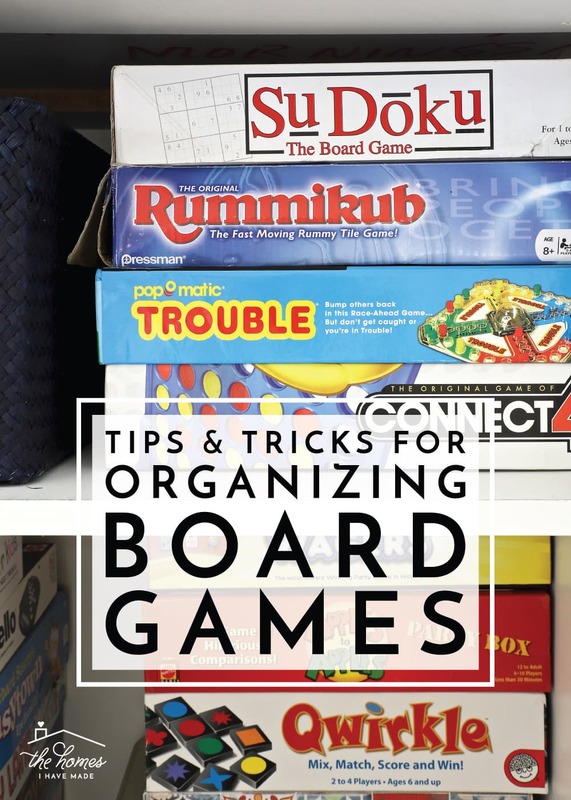 I’ll be giving you a tour of our laundry room in a few weeks once I have it all sorted out just right; but today, I wanted to share some of the smart tips and tricks I employed while finally organizing all our board games so they can be played with and put away, hassle free! Before I dive into the nitty gritty, let me give you a brief tour of our game cabinets. These two cabinets sit just off the playroom and have held a variety of things since we first moved in. Although I think we originally put games in here, we ultimately ended up using these deep cabinets as our linen closet for most of the last few years. Until this recent makeover, games were split between the playroom trunk (kid-friendly games) and the laundry room (which made no sense). Now, 100% of our games are housed in these two cabinets…and most importantly, they are all stored in a way that we can easily get them out and back in without too much trouble! 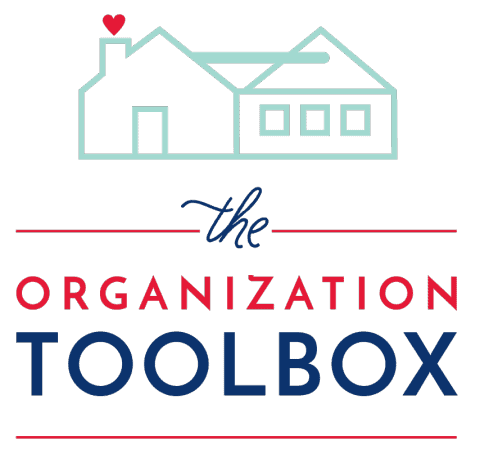 This quick organization project took me less than an hour and didn’t require any fancy storage systems or cute labels. However, the few storage tricks I employed here will make these cabinets a “game changer” for our family – ha, see what I did there?!? 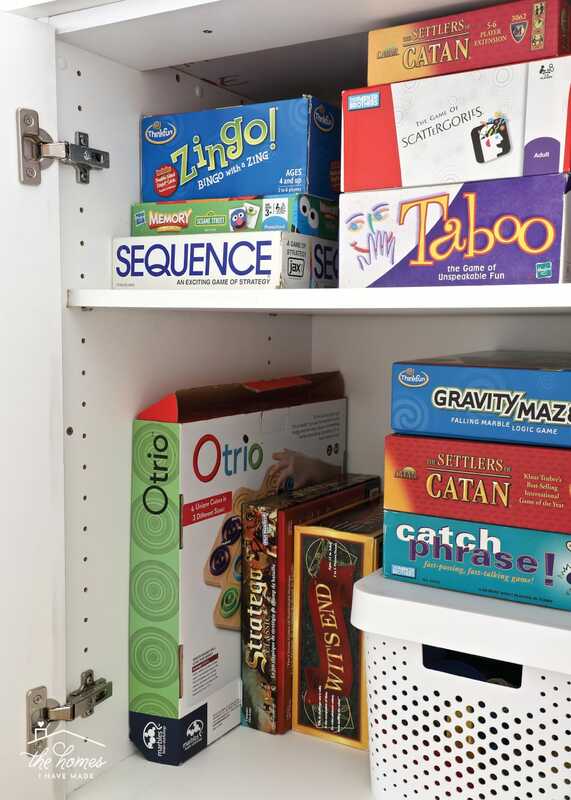 If your game closet is a mess too, try these strategies to bring it back to the fun zone it should be! I’m not entirely sure why we had our games split into “kid-friendly” and “adult” games, but I’m sure at one point, it made sense. 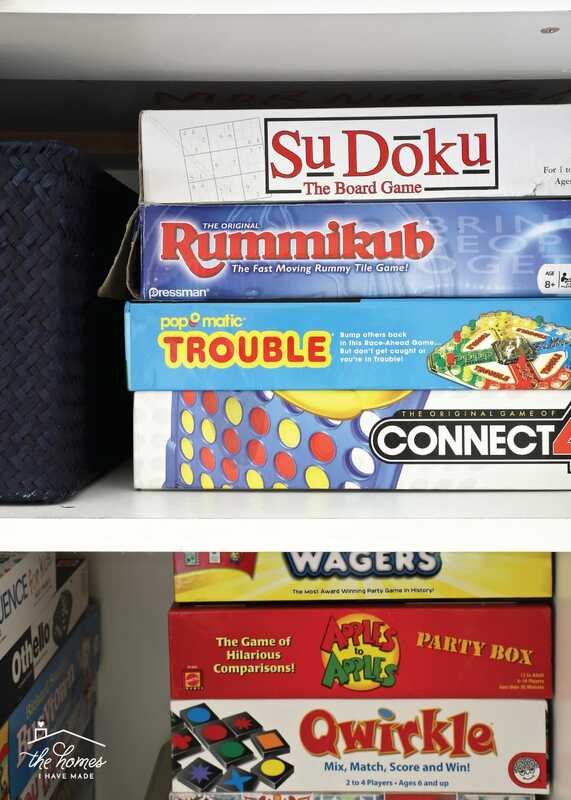 However, over time, it felt like games were put back in the wrong spot (making it difficult to locate specific ones) or there were certain games we weren’t playing with Henry because they were in the “adult” cabinet (although he was ready to play them). 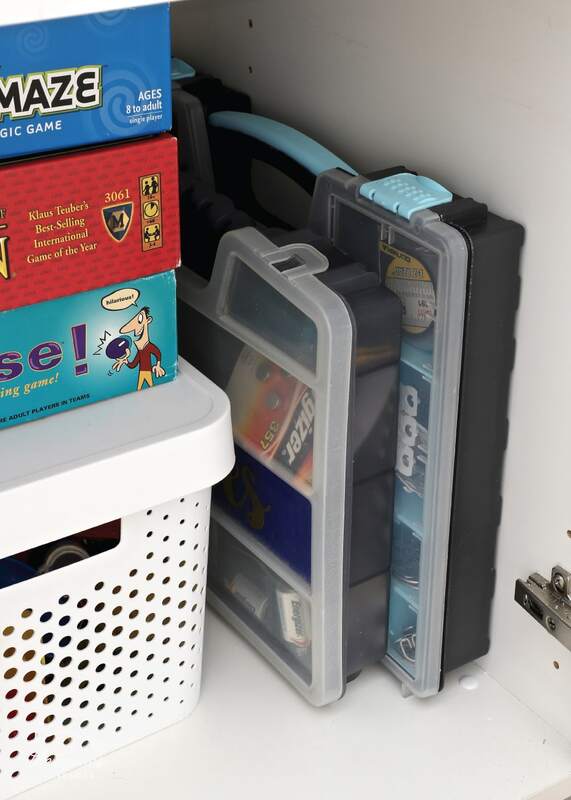 I recommend identifying a place to store games where they will all fit comfortably and can be easily accessed by those who want to play them. This way, there is no confusion about where things are or where things go back to when play time is over. It is so frustrating to sit down to play a game only to find that necessary pieces have been lost, damaged, or squirreled away by the two-year old. 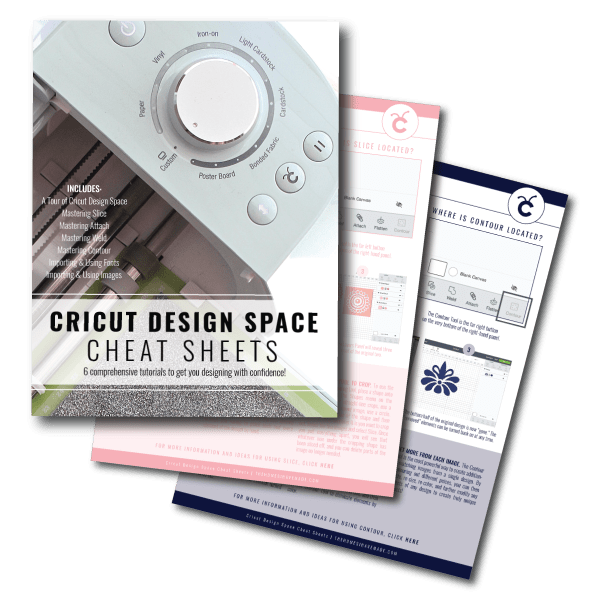 There is no point in carving out storage space for games that can’t be played, so first do a quick check of each one to make sure they are complete. Although I purge a ton of things around the home, I’m actually a big fan of keeping (complete) games, even ones you don’t play. Why? Because tastes change, and what once was the dud on the bottom of the stack might someday become the family favorite! 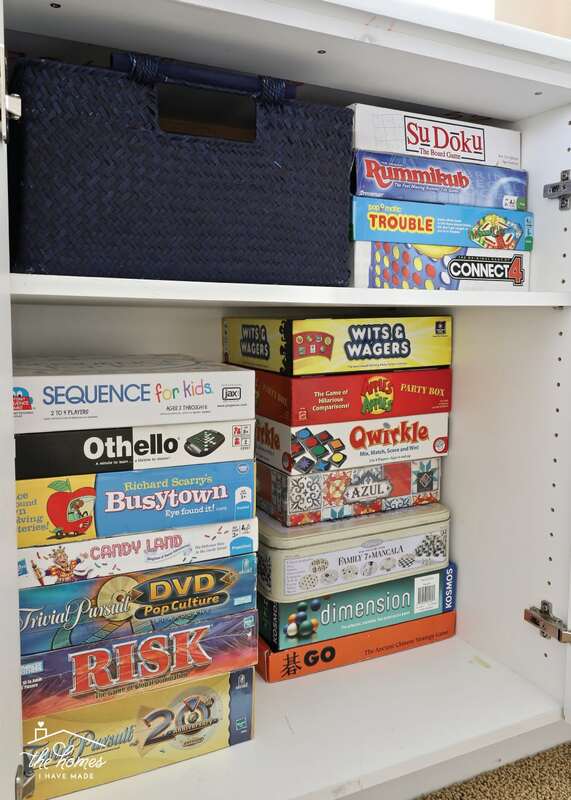 As I mentioned, the trunk in the playroom was used to store our kid-friendly games. But think about it: the only way to put games into a trunk is to bury them on top of each other. This meant it was always very difficult to see what was in there, not to mention getting games out and back in so that the trunk would close properly. With all of our games now stacked on cabinet shelves, it didn’t take long for me (or the boys) to notice how much quicker and easier it is to pull out what we want. So while storage trunks are great for some things, stacking games on shelves really is a better solution! Oh how I wish board games came in standard-sized boxes so they could all stack and fit neatly on a shelf. Alas, each game seemingly comes in its own custom-sized box, which admittedly can making stacking and sorting somewhat difficult. Although my original instincts were to sort our games by type, I found I could create much more order when I sorted them by size. While there were a few outliers, many of our games were either long rectangles, small rectangles, or squares; and I stacked them as such. 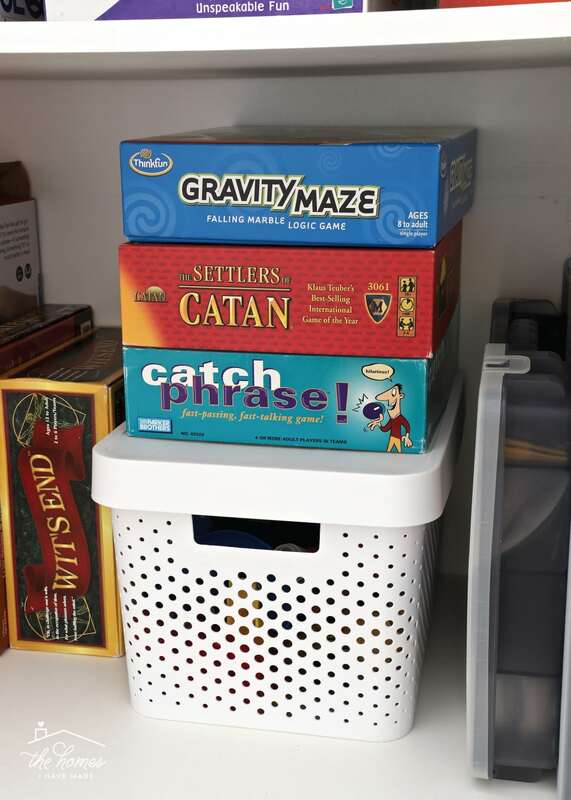 This not only helps your shelves look much neater, but sliding a specific game out will be easier when the stack doesn’t feel like it’s going to topple due to all the different box sizes! When figuring out how exactly to place the games, I strongly suggest you play “Tetris” with your shelves (if they are removable). 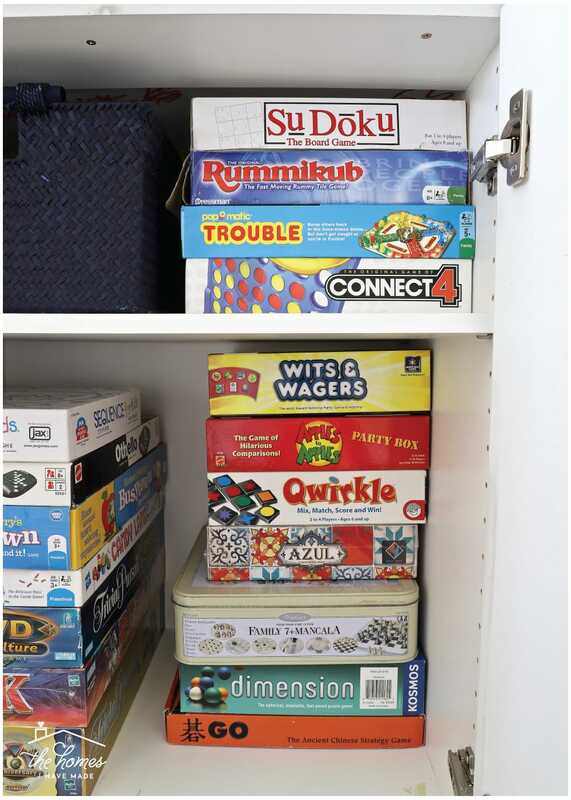 Simply by moving shelves up or down, you may be able to accommodate certain games better or possibly even fit more games overall since you eliminate wasted/empty space. 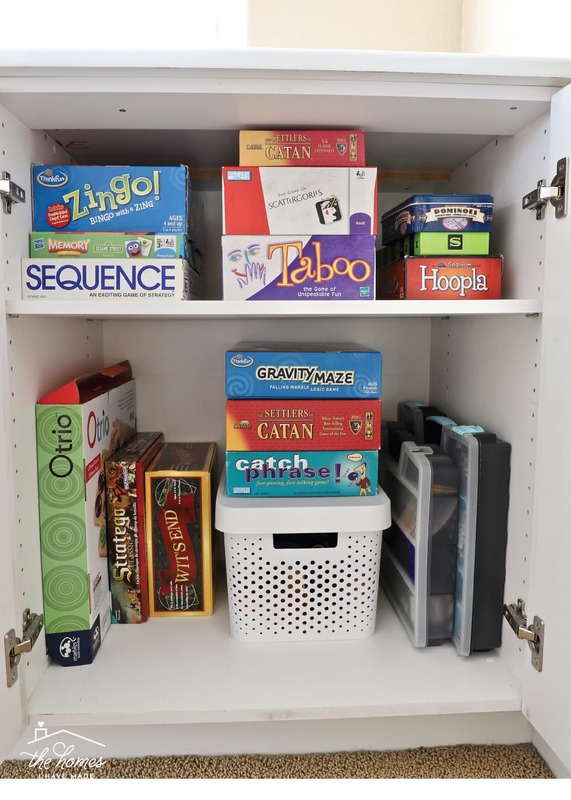 By changing the shelf height in our cabinets, I reduced the amount of wasted space on the top shelf while making room for our taller Otrio game! 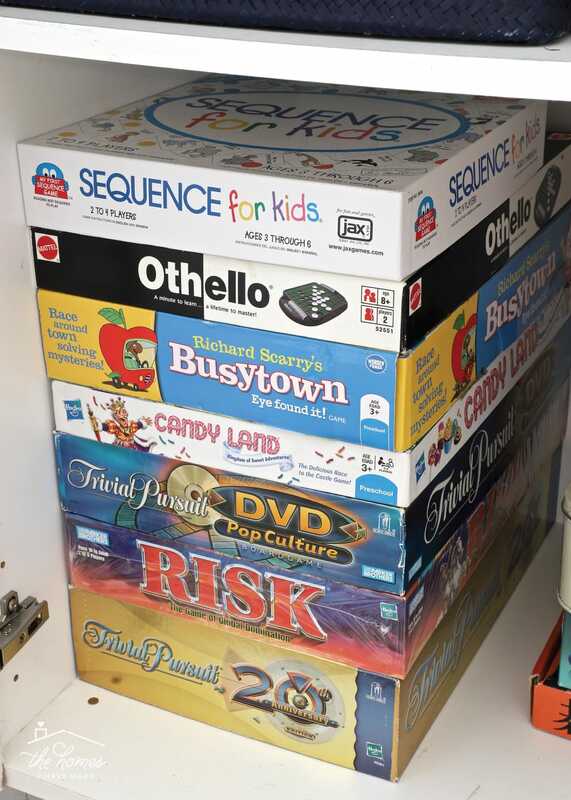 While most games really are best stored stacked on top of each other (to prevent mess), don’t hesitate to turn the boxes on their sides if it means you can fit more games or fit them better into your space. 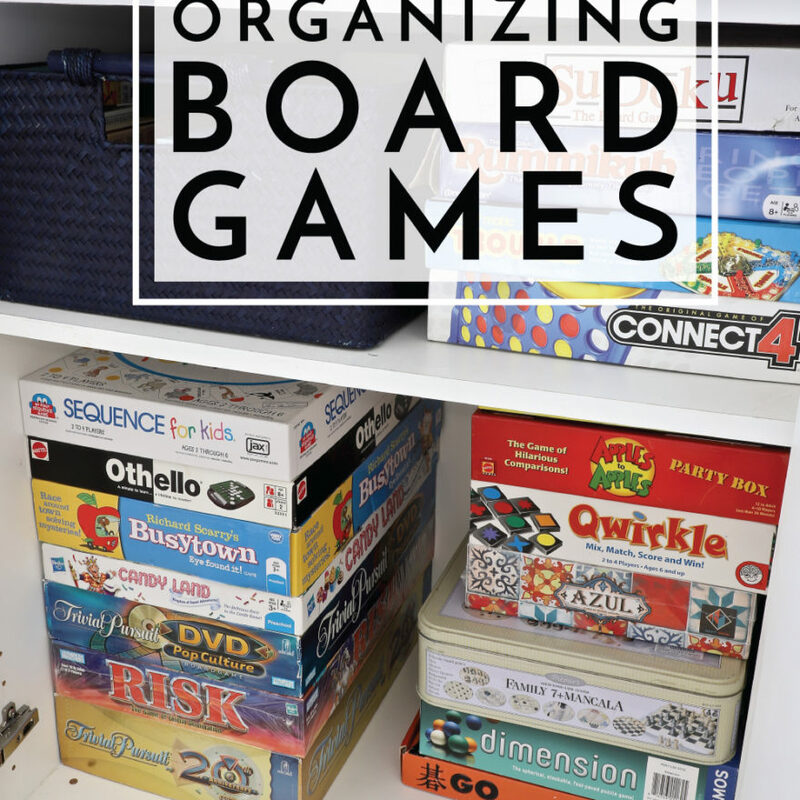 If you do place some board games vertically, I suggest you pick ones that don’t have lots of little pieces that spill out easily! Admittedly, when we pull out a game, it’s most often a smaller card-style game such as Skip Bo or Phase 10. We’ve made it a habit of picking up these smaller games when we stumble upon ones we don’t have, so our “small games” collection has grown quite large. These tiny boxes are terrible for stacking, so I strongly recommend finding a bin or basket that can comfortably hold them all. 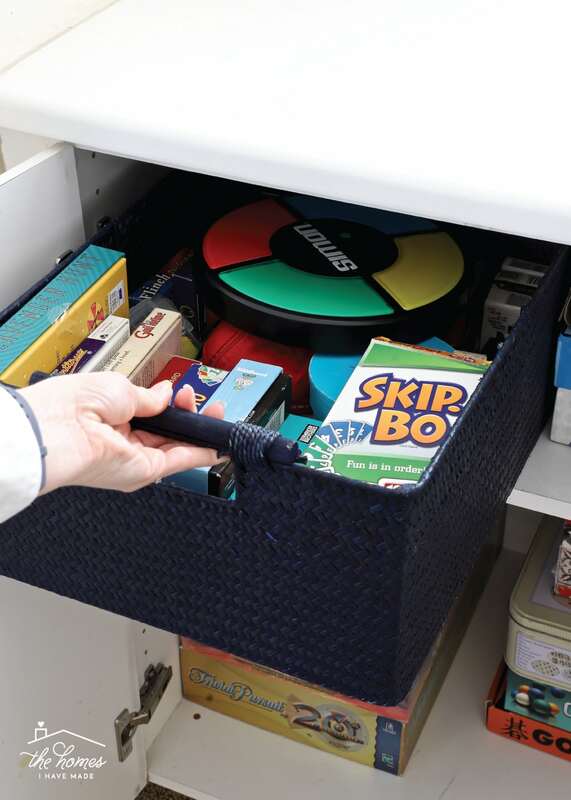 Not only was I able to find a basket that fills the depth of our cabinet (so there is no wasted space behind the basket! 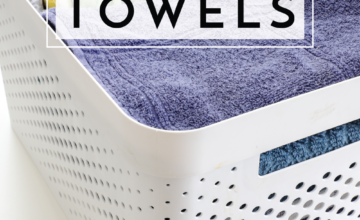 ), but it has a sturdy handle which allows us to pull the basket out like a drawer. One of the main reasons burying games isn’t ideal is because it’s incredibly difficult to see what you have. And since picking out a game often feels like browsing through a store, being able to see what you have, at a glance, increases the chances of games getting pulled out in the first place. So…when you are stacking your games, do whatever you can to put the spines (game titles) facing out so they can be easily read. This means no burying and no double-stacking from front to back. 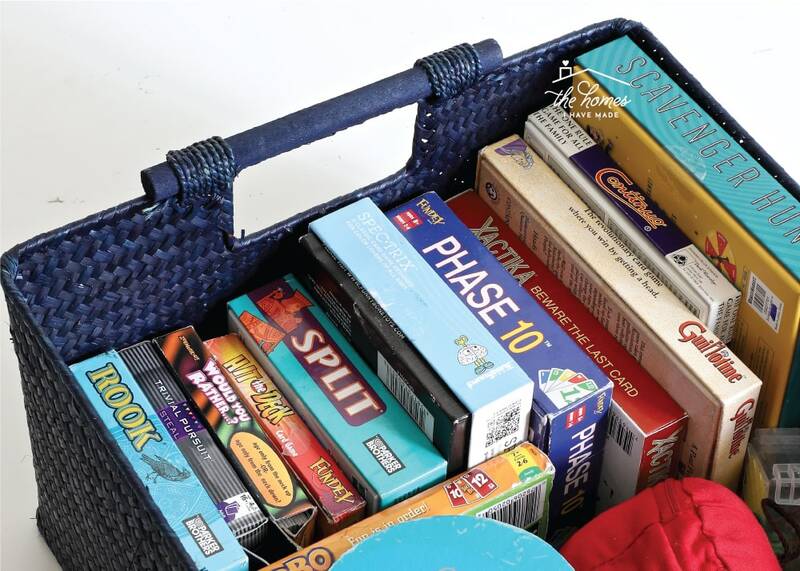 Notice that even in our small games basket, games are on their ends to reveal their spines, rather than stacked on top of each other. Now with a quick look, we can easily see everything we have! If you haven’t picked up on it yet, Greg and I are pretty big game players and have been our entire relationship (although we find less and less time to play these days!). We used to joke that we were going to write a game “review” book someday, and part of each review would be an assessment of the packaging. 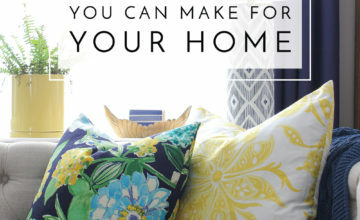 We love it when the box is sturdy, and there’s a spot for each piece and part. It drives us crazy when a game comes in bad packaging that doesn’t survive the initial open. Over time, we’ve learned that instead of wrestling with horrible packaging each time, sometimes it’s best to get rid of the box and re-package the game into something sturdier. We’ve done this with our marble run and a bunch of well-loved card games over the years. 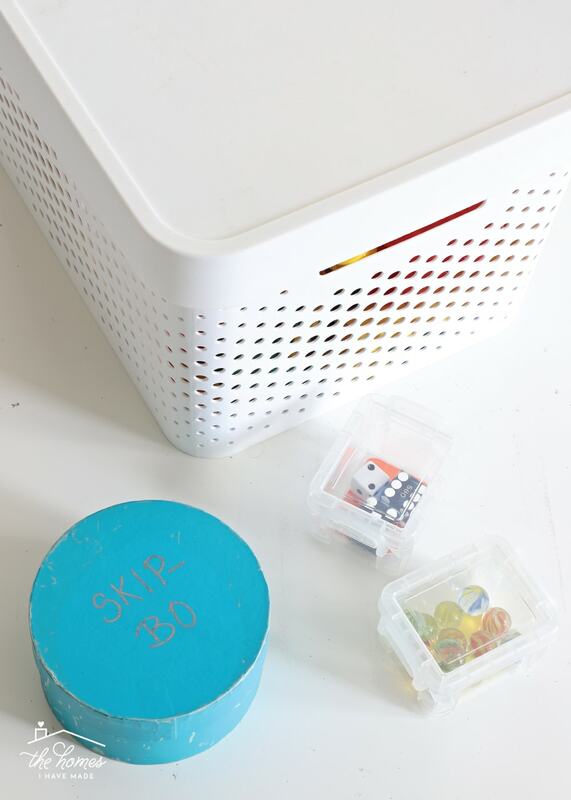 We’ve also found it handy to corral extra dice and marbles into snap-lock containers! 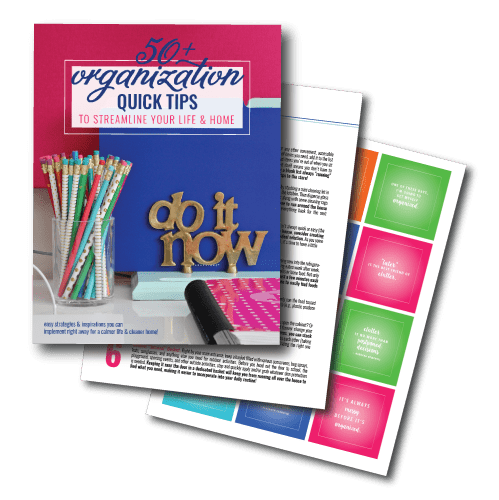 Organizing board games can certainly be an exasperating experience, but with some smart sorting and creative storing, I promise you can bring more order to your collections. 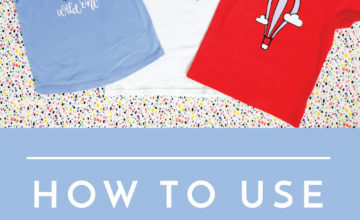 Give these tips a try! 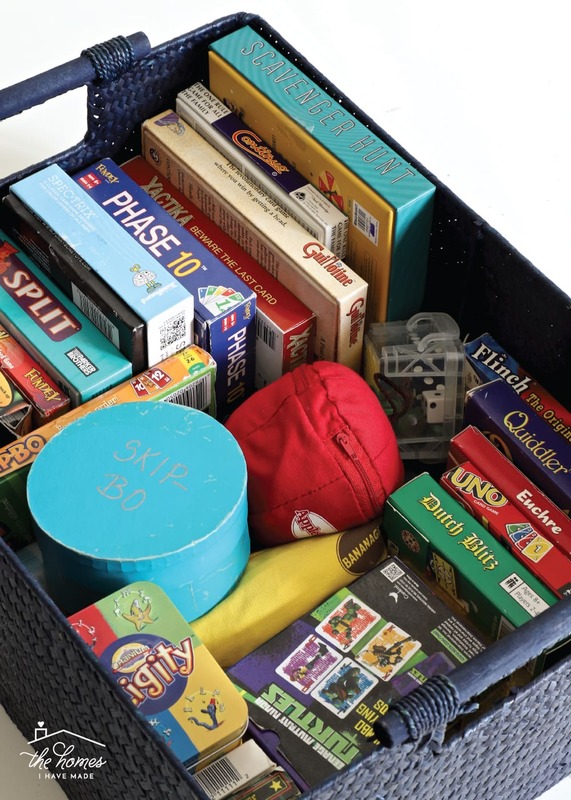 Not only will you not groan every time you have to open the game closet door, but you might actually feel more excited to pull a game out and play with the family!